Jane Addams and Ellen Starr moved into Hull House on September 18, 1889. They started their program by inviting people living in the area to hear readings from books and to look at slides of paintings. After talking to the visitors from the neighborhood it soon became clear that the women of the area had a desperate need for a place where they could bring their young children. Addams and Starr decided to start a kindergarten and provide a room where the mothers could sit and talk. Within three weeks the kindergarten had enrolled twenty-four children with 70 more on the waiting list. Soon after a day-nursery was added. Other activities for the neighbors soon followed. Jane Addams ran a club for teenage boys and Ellen Starr provided lessons in cooking and sewing for local girls. University teachers, students and social reformers in Chicago were also recruited to provide free lectures on a wide variety of different topics. Over the years this included people such as John Dewey, Clarence Darrow, Susan B. Anthony, William Walling, Robert Hunter, Robert Lovett, Ernest Moore, Charles Beard, Paul Kellogg, Jenkin Lloyd Jones, Ray Stannard Baker, Francis Hackett, Henry Demarest Lloyd and Frank Lloyd Wright. In 1890, Julia Lathrop joined Jane Addams and Ellen Gates Starr at Hull-House. All three women had been students at Rockford Female Seminary together in the 1880s. Lathrop, who had been trained as a lawyer by her father, the United States senator, William Lathrop, was an excellent organizer, and took over the day to day running of the settlement. In the early days of Hull-House, the Christian Socialism that had inspired the creation of Toynbee Hall influenced the three women. This was reinforced by the arrival in 1891 of Florence Kelley at Hull-House. A member of the Socialist Labor Party, Kelley had considerable experience of political and trade union activity. It was Kelley who was mainly responsible for turning Hull-House into a center of social reform. The presence of Florence Kelley in Hull-House attracted other social reformers to the settlement. This included Edith Abbott, Grace Abbott, Alice Hamilton, Charlotte Perkins, William Walling, Charles Beard, Mary Mc Dowell, Mary Kenney, Alzina Stevens and Sophonisba Breckinridge. Working-class women, such as Kenney and Stevens, who had developed an interest in social reform as a result of their trade union work, played an important role in the education of the middle-class residents at Hull-House. They in turn influenced the working-class women. As Kenney was later to say, they “…gave my life new meaning and hope”. Florence Kelley and several other women based at Hull-House carried out research into the sweating trade in Chicago and this led to the passing of the pioneering Illinois Factory Act (1893). Kelley was recruited by the state’s new governor, John Peter Altgeld, as the chief factory inspector, and two other women involved in the research, Alzina Stevens and Mary Kenney, also became inspectors. Hull-House gradually expanded to include about a dozen other buildings used for classes and clubs, a nursery school, the only public library in the neighborhood, a playground and one of the first gymnasiums in the country. Hull-House opened a boarding home for girls, without chaperon or “lady board of managers.” Many of the neighbors came to the center for weekly baths. 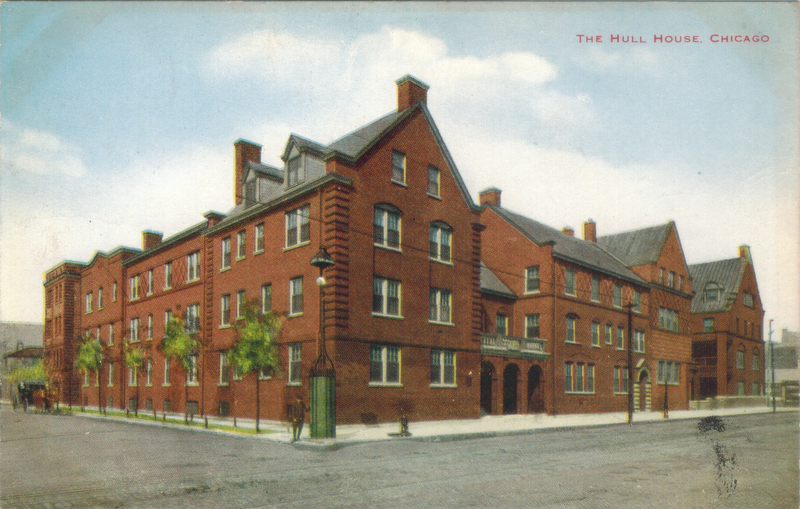 Hull-House exists today as a social service agency, with locations around the city of Chicago. The University of Illinois at Chicago has preserved a small part of the buildings as a museum, after the University razed many of the original buildings of Hull-House. The original Hull mansion remains with much of the furniture used by Miss Addams. South of the original Hull-House is the restored settlement dining hall, one of the first buildings in addition to the main house opened by Jane Addams. University and community groups for meetings now use the hall. Hull-House Yearbook (1907). The Internet Archive. Yes, a heroic, courageous woman who followed through on her ideals. Regarding social work, I wonder what was going on in the black community when many were coming north after the civil war. 1. The Niagra Movement; 2. Black Studies in the U.S. Department of Labor; and The Civil Rights Act of 1875.
cool i needed research for a paper in social studies ! thanks Jane Addams for making the hull house! Can’t wait to visit! Looks very interesting! I am doing a history fair with two friends and it looks amazing its for the Chicago metro history fair. It’s so interesting and has many sources. Although the Hull-House Association closed in 2012, their ideas live on. Some of the Association locations were taken over by other neighborhood organizations, such as Christopher House in Rogers Park. Some of the organizations that got their start at Hull-House have been independent for some time. The Immigrants Protective League became the Heartland Alliance, the Mary Crane Nursery became the Mary Crane childcare organization on the city’s west side now. The Jane Addams Hull-House museum also lives on, inspiring the next generation of reformers and activists.